Even though the second night was a lot better than the first and we managed to catch up a bit on sleep, it can’t be enjoyable to wake up around 5.00am for 3 consecutive days. As the frantic, somewhat chaotic packing took place in darkness, Patrick approached me to give a little bit of advice in hushed tones. He suggested that I stayed with my No. 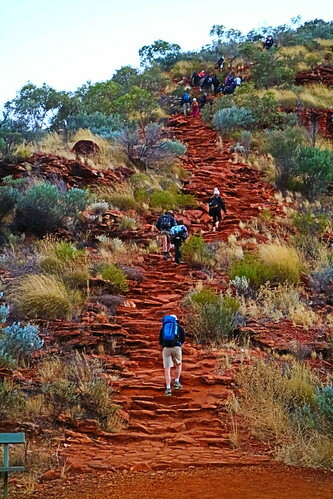 2 and didn’t join the rest of the group on the Kings Canyon trek. He described the hellish climb, with the steep inclines, big steps and unstable rock. Yes, my No. 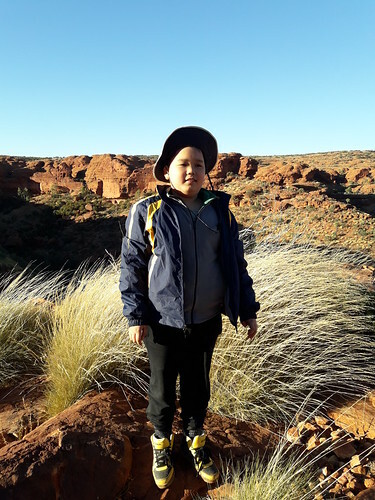 2 did just fine at Kata Tjuta, but according to Patrick, Kings Canyon is a lot worse. He sounded very concerned, but beneath all that, I think Patrick was just a strict time-keeper. He was probably more afraid that we would hold back the group. He estimated that the group would take about 3 hours to complete the entire circuit. I figured that with my help and guidance, my little one would take at most 4 hours. Sensing how reluctant he was, I decided not to bargain with him. Let him please the majority. By then, there were probably already a few disgruntled members in the group complaining to him about the food, the lack of amenities and low hygiene standards. Now, let’s look at the facts on the ground. 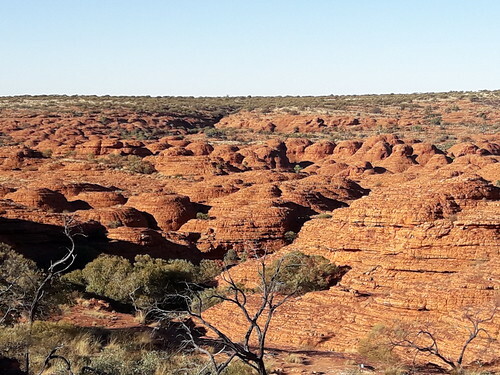 According to published info, 3 walks exist at Kings Canyon. 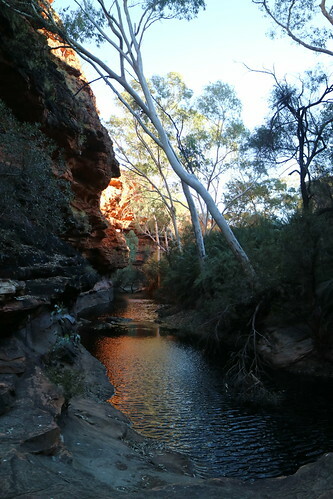 The 2 km (return) and approximately one-hour Kings Creek Walk traces the bottom of the gorge. 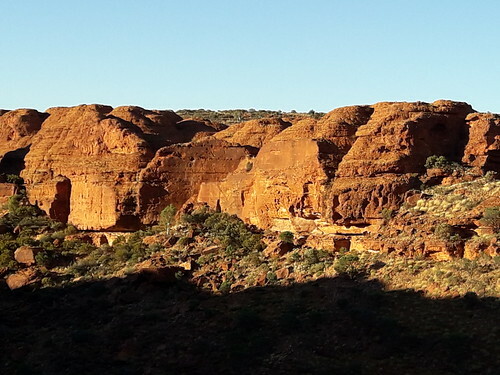 At the end of the walk is a platform, with views of the canyon walls above. 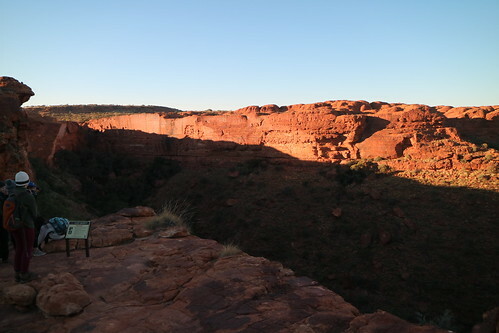 The 6 km (loop) Kings Canyon Rim Walk traces the top of the canyon and takes 3 to 4 hours to complete. 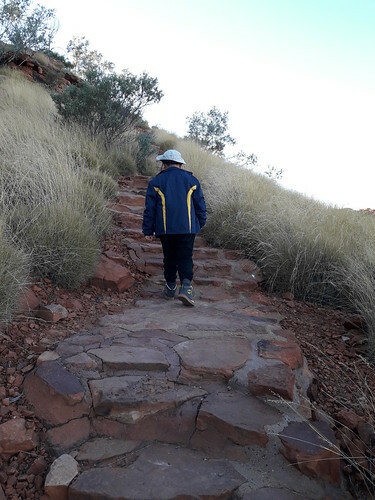 A steep climb at the beginning of the walk, which locals call “Heartbreak Hill” (or “Heart Attack Hill”, due to its steepness), takes visitors up to the top, with spectacular views of the gorge below and of the surrounding landscape. About half way during the walk, a detour descends to the Garden of Eden, a permanent waterhole surrounded by lush plant life. 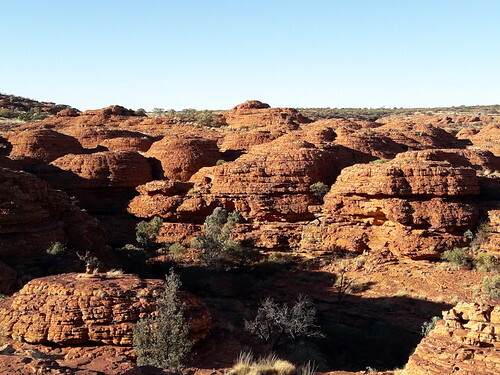 The last half of the walk passes through a large maze of weathered sandstone domes, reminiscent of the Bungle Bungle. A slow descent brings the visitor back to the starting point. It didn’t sound like anything my little one can’t do with a bit of coaxing and prodding from me, but I guessed that this being a group tour, the interests of the group had to be respected. I reluctantly passed my camera to my No. 1 and instructed him to take some nice pictures. I then held my No. 2’s hand and led him on the 2km sissy walk. Then, Patrick informed me that a Taiwanese girl in our group had injured her knee and she decided to join us. Relieved of the “burden”, Patrick led the rest of the group on an assault of “Heart Attack Hill”. With one young lady and a young man in tow, I walked on the sandy path in the opposite direction from the car park. Presently, we entered a forested area. The path was quite obvious, only losing its character briefly over some huge slabs of rock that it couldn’t cut through. In about 15 mins, we had reached the end of the trail. We were at the bottom of the canyon. There seemed to be a way forward, but it was sealed and probably only accessible to authorised persons. Looking up, what could have been steep and spectacular walls of the canyon were obscured by trees. This couldn’t be what we came all the way here to see. As fate would have it, we would see a lot more. While busy talking to the young lady, we didn’t notice that my little one had disappeared. Since there was only one way that he could have gone, we went back the same way to look for him. As we passed the turnoff to Heart Attack Hill, the Taiwanese lady’s partner came “rolling” down the path. “He must have gone to the bus.” I deduced, concerned but not overly worried. We walked towards the car park and soon spotted him. I stopped him from going to the bus and just before we reached the car park, we found another path on the left. Curiously, both girls seemed to have recovered and my little one was also in high spirits. We decided to check it out. So we walked on another sandy path which gradually grew steeper. 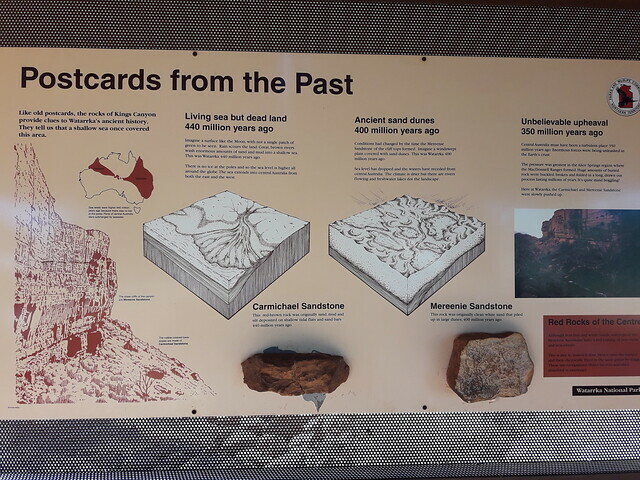 We ascended the first steps, not expecting anything worthwhile, but there seemed to be some force of attraction that pulled us towards a major discovery. The path was pretty steep, but very quite manageable as the steps were most kindly constructed out of broken rock and cement. Neither the two girls nor my little one had any trouble at all. I was expecting this trail to be not too different from the one we just left, but I was wrong. It actually kept climbing and climbing. The higher we went, the more interesting the views got. 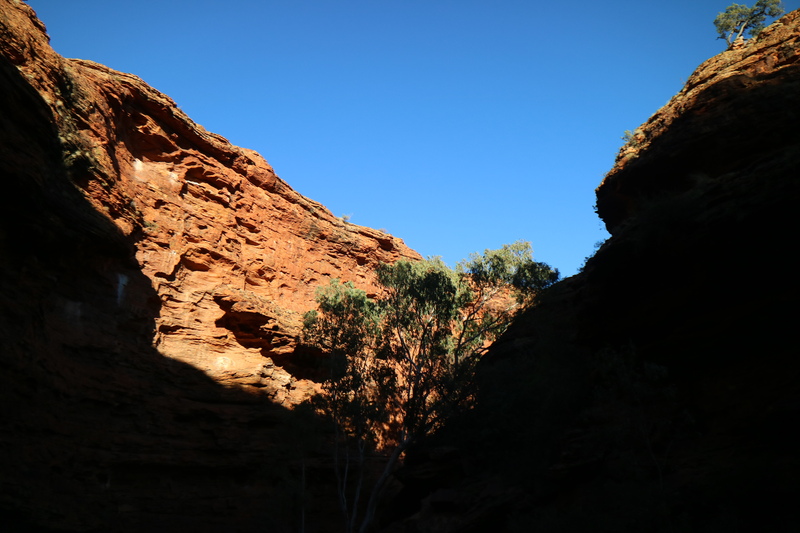 One side of the canyon wall, gradually highlighted by the rising sun, soon came into view. As we reached the top of a ridge, the wall of rock on our left disappeared and the wind was unleashed, setting the patches of grass in waves of motion over the lifeless, stolid rocks. One ridge led to another. The clear path disappeared, spreading out over wide slabs of rock interrupted by yawing cracks and chasms. We had to rely on signs to guide us and one sign pointed to the 22km trail to Kathleen Springs. As we ascended further, we found ourselves in some sort of a labyrinth. There were towers of rock all around us. Spectacular features appeared everywhere. 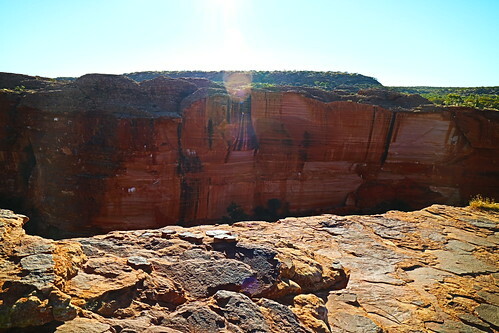 Layers upon layers of bright orange rock stacked up like volumes of geological history. 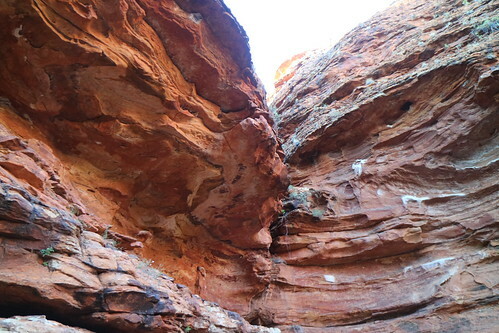 Also resembling brick walls with domes as roofs, some of these formations could indeed be mistaken for ancient ruins. 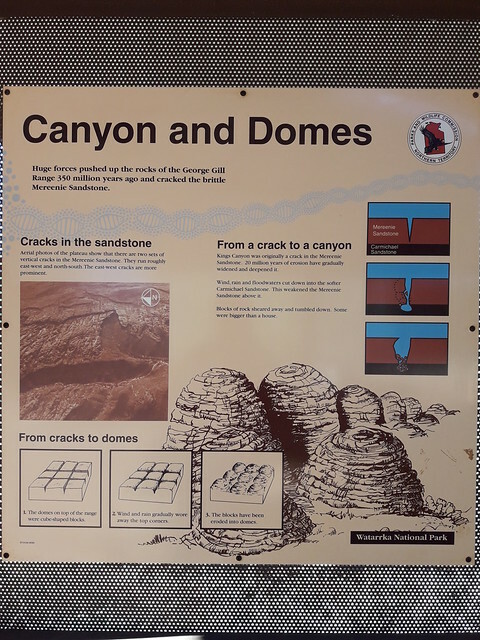 The domes viewed from a distance were most stunning, so castle-like, with caves that looked like entrances, giving an illusion that this could be the final resting place of some lost civilisation. We had separated from the group for almost 2 hours. I felt it prudent to turn back then. The girls agreed and I began to lead the descent. Halfway down, a hopping kangaroo landed near us with a loud thud. Before we could react, it had disappeared among the rocks. We soon reached the car park and after looking at some maps at the visitor’s shelter (free wifi), I realised that we were on the same path as the group, albeit in a different direction. Had we stayed on the trail, we would have run into them. We just took a toilet break and rehydrated ourselves. We didn’t have to wait very long before Patrick and the rest of the group showed up. My No. 1 was with them, a bit tired, but quite happy. These last few of pictures below were taken by him on the 6km circuit. I think he got the Garden of Eden in there. “See you later.” he said. We ended up having our dinner at the bar. As customers of the affiliated travel agency, we had a big discount for the food. It turned out to be an enjoyable evening after all.